If you've fallen into a chronic state of thinking sleep is better than anything else you might think of doing, you're probably an Olive personality in a negative state. This can occur after a long illness - when you've used every bit of your physical energy just to get well. It can also happen if you've spent weeks or months caring for a loved one who was ill - or if you have simply been pushing yourself too hard, working too many hours, eating an unbalanced diet, or losing sleep for any reason. The negative Olive state occurs when you shut off communication with your higher self and fail to heed the warning signs that you're pushing yourself too hard. 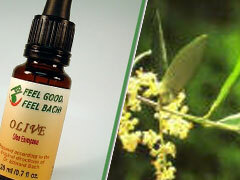 Fortunately the Bach Flower Essence Olive can help you regain that lost energy. By putting you back in balance and helping you reconnect with your higher self, Olive acts as a restorative to both your mental and physical self. Interestingly, while most of the Bach Flower Essences work to bring you back in balance after an event, Olive can help prevent exhaustion. If you know you're going to be facing a long and stressful ordeal, take it ahead of time to stay balanced and full of energy. Or, if you'd like to take our questionnaire to see which of the Bach Flower Essences are right for you, visit us at Feel Bach! Are you one of the thousands of citizens who are muddling through every day stressed almost to the breaking point? Today the news alone is enough to cause stress, even if we didn't have things popping up in our personal lives to add to the pressure. Recognizing that you're in that state is the first step. Doing something about it comes next, and it IS important. Stress can take the joy out of life from an emotional standpoint, and it can harm your physical health as well. * Turn off the T.V. Unless there's something you can DO about radiation leaks in Japan, a missing child in a city 500 miles from you, or a plane crash, just don't listen. Focusing on the bad news will give you more stress. * Get some exercise. If nothing else, go for a walk. * Meditate, or do deep-breathing exercises. You'd be amazed how much better you'll feel if you simply take a deep breath, sigh, and look up. * Spend some quiet time with people you care about. Just making time to connect with those you love can help you de-stress. * Put a bottle of Feel5ive in your pocket, and use it any time you start to feel tense. Dr. Bach's original formula will help you get through all of life's stressful moments. From a confrontation with your boss to a dentist appointment, you'll face it more easily with the help of Feel5ive ahead of time. And if the stressful event has already happened, Feel5ive will help you get over it. Remember, Feel5ive is safe for everyone from your infant to your elderly grand-parent - and even your dog or cat! It can be safely used even by those taking prescription medications, so don't hesitate to use its calming powers. ...You may be a Water Violet personality. "Delicate but upright" is the description given to the water violet, and it fits those with a Water Violent personality. Why should it surprise us that the power of Bach Flower Essences should reflect the strengths of the flowers from which they are derived? The water violet's true strength lies hidden beneath the surface of the water in the form of leaves that lend strength and stability. Translated to human behavior, the Water Violet personality exhibits strength and dignified superiority - choosing their own way without fanfare, and without outside influence. These are the individuals who are calm in crisis - who can take charge with grace and dignity, and soothe others. Water Violets are decidedly not given to emotional outbursts, whether in negative or positive situation. Because they are strong, people turn to them for help and advice, and too much of that can put the Water Violet personality into the negative state. This is when they begin to believe in their own superiority and "specialness" - and it causes them to withdraw even further. But, since we humans do need each other, withdrawal creates a strain, which can lead to tension in the body, and illness. Fortunately, the negative state is often short lived. 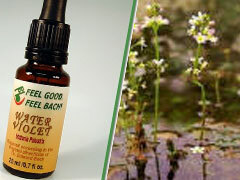 The Water Violet person will come back into a positive state with Bach Flower Remedies treatment and a bit of rest. To read more about Water Violent and other Bach Flower Essences, come to Flower Bach, and to take the questionnaire and see which Bach Flower Remedies would be most helpful to you, visit Feel Bach!